DC Shorts turns the spotlight on truly independent short films created around the globe. In 2018, we received over 1,250 entries from 70 nations, and screened 130 films from 30 countries in 18 unique showcases over 11 days to audiences of more than 9,000 people. Our main judging criteria is STORY. Do you have an interesting, original story about developed, well-written characters? If so, then you are a good fit for us. We screen all genres and styles of films. We screen films from :30 seconds to 40 minutes. Longer films may be considered, but are generally difficult to program. We will not consider any film over 40 minutes. Films that screened at past DC Shorts Film Festivals have gone on win countless other competitions, including the Academy Awards. Washington, DC has some of the most sophisticated audiences in the world. In a city with over 70 film festivals a year, DC Shorts continues to be a dominant force for film distribution in the region. The DC Shorts Film Festival is the largest short film event on the east coast of the United States. DC Shorts just topped the list as Moviemaker Magazine’s Coolest Short Film Festival – an honor we are thrilled about, and has been listed as a “Festival Worth the Submission Fee” — again. Extended Entry Deadline is April 30, 2019 or until there are no more slots available – which ever comes first. There are a limited number of Waivers available. Read about the review process and look through the rules below PLEASE! There are good reasons for the rules, and a lot of time and care has gone into writing them — the rules are a detailed description of what happens to your film when received by our office, as well as how our review and selection process works. Complete your entry and upload your film by the Extended Deadline, Tuesday, April 30, 2019. Materials received after this date will be discarded without notice or refund of entry fee. Each submission requires a separate entry form and fee. Incomplete applications, failure to include payment, or submitting materials we are unable to preview will disqualify your entry without refund. All filmmakers will receive notice of acceptance or rejection via email, as well as a complete report with screeners’ comments. If you do not receive this email by the notification date, please contact the office. For the 2019 Festival, we expect to review 1,500 short films and 200 screenplays. We hope to include around 130 films in the final showcases. The competition can be kinda tough. All applications are referred to by an assigned identification code. From this point on, films are only referred to by this code number. Our reviewers are local filmmakers, industry professionals, film enthusiasts, and trained members of our audience. All reviewers are interviewed before they are trained – and all have attended previous versions of DC Shorts as paying audience members or presenting filmmakers. Films are watched in their entirety (rare among film festivals) and evaluated on aspects such as strength of plot, originality, technical proficiency, acting, editing, and sound design. Reviewers are also asked to leave a personal comment as to how they believe the film will play to our audience. Screeners viewed online are subject to the computer hardware and speaker setup of the individual screener. Some have high-end speaker systems and large screens, while others still use older PC laptops and built-in speakers. At the end of the first round, a list of the top 300+ films is generated by analyzing raw scores, rankings, trends and comments. These films are then sent to a second team of screeners consisting of former screeners, DC Shorts Board Members, local business people and sponsors. They watch each film and make programming notes, but do not add to the previous scores. At the end of the second round, select screeners and the festival director choose a final lineup based on scores, the time constraints of showcases (each showcase runs for approximately 90 minutes, with an average of 8-10 short films featured in each showcase), and how films will play in a show with each other. We also try to include 10% of our films from filmmakers creating content around the greater Washington, DC region. DC Shorts—and every major film festival—program the best films available to them that offer a fresh viewpoint or a unique story or character, meet programming time constraints, interest our audience, play well with the other films programmed, and are created by filmmakers we believe in. MY FILM IS OVER 40 MINUTES. IS THAT OK? The time limit of :40m is our exact cut-off point. The way we program — showing as many different types of film in 90-minute blocks — makes it difficult to show many longer films. In addition, when we receive multiple films of the same theme/subject matter, we often tend to program those with stronger storytelling, which are often the shorter versions. That said, we have screened exceptional films up to :30m in the past. In our experience, most 20-minute films could be re-edited to a much stronger 12-minute piece. One piece of advice we learned in film school was, “That’s a nice 13-minute movie. But it is a fabulous 9-minute film.” Ask yourself the same thing and really think about it. DO YOU ACCEPT MUSIC VIDEOS? In the past, we have screened music videos that are heavily story-driven. No plot, no play. WHAT ABOUT WORKS IN PROGRESS? DC Shorts does not accept works in progress. Only submit and send your online screener when your film is complete. We are unable to update your application with a new URL after the film has been submitted. ARE THERE TYPES OF FILMS YOU DO NOT PROGRAM? DC Shorts has shown films in every genre and style. The best way to see what types of films we are likely to program is to visit dcshorts.com/archive. Here, over 350 films are available for free. That said, our audiences are not fond of torture or violent horror, sophomoric humor, and violence against women or animals. GUIDELINES FOR ALL FILMS. Films must have been completed after January 1, 2018. Films must not exceed 40 minutes in length, including credits. All non-English language films must have English subtitles. A separate entry form and additional entry fee must be submitted for each film. ENTRY FORM AND PREVIEW MATERIALS FOR ALL FILMS. All films must be submitted and paid for through filmfreeway.com. Illegible or incomplete entry forms will not be accepted. Entry forms that do not include full payment of entry fees or working online screener URL at the time of submission will not be accepted. ONLINE SCREENERS. We accept online screeners through Vimeo.com. We will not watch films submitted on any other websites. DC Shorts, its members, directors, employees, and volunteers are not responsible for broken or incorrectly submitted URLs. Submissions may not be withdrawn from the Festival once they have been entered, except at the sole discretion of the Festival directors. There are no refunds for entries with incomplete entry forms, or incorrectly formatted preview materials. In our experience, Vimeo.com screeners have the best HD playback, and are preferred by our screening team. DC Shorts no longer accepts DVD screeners. AWARD INFORMATION. Awards will be presented in the following categories: Outstanding First-Time Director; Reviewers Choice (chosen by Review Committee); Outstanding US Narrative Short (selected by a panel jury); Outstanding International Narrative Short (selected by a panel jury); Outstanding Animated Short (selected by a panel jury); Outstanding Documentary Short (selected by a panel jury); and Outstanding Local Film (selected by a panel jury). In addition, audience members in each screening will vote on Audience Favorites. Awards are subject to change before the event, with an updated list to be posted at festival.dcshorts.com. All awards will be announced at the final Filmmaker Brunch. NOTIFICATION OF ACCEPTANCE. Letters of inclusion or non-inclusion, with a link to the reviewers’ comments, will be sent to the email address provided on the entry form no later than July 1, 2019. DC Shorts does not send physical mail — please ensure that your email address is accurate on your application. DC Shorts is not liable for emails delayed by spam filters, server rejections, or outdated email addresses. SCREENING FORMATS. Films, acceptance contracts and other materials mentioned in the Letter of Acceptance must arrive at the Festival office no later than 11:59pm, July 15, 2019. DC Shorts requires two files for projection: a professionally converted DCP (24fps only) and an AppleTV formatted .mp4 file. DC Shorts and A DCP Company to be determined will work together to coordinate delivery and quality control and more info will be sent after acceptance. Films with incomplete materials by the deadline will forfeit their ability to screen in the festival. DC Shorts, its members, directors, employees, and volunteers are not responsible for lost, misplaced, and undelivered film and media. FILMMAKER AND WRITER ATTENDANCE. 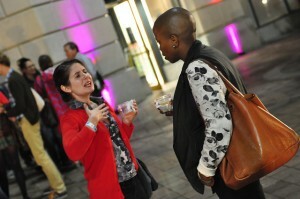 DC Shorts encourages filmmakers to attend the festival. To this end, we try our best to assist every filmmaker (and one guest). In the past assistance included meal pass to be used at local restaurants, complimentary housing in a volunteer’s private home, discounted hotel rooms, passes for public transportation, invitations to all parties, tours and events, and passes for all film screenings (either in the general theater or in our special Filmmaker Lounge.) DC Shorts is unable to provide financial compensation for travel expenses or additional expenses incurred during the Festival week. Assistance does vary from year to year. PUBLICITY AND MARKETING. All selected films and scripts may be excerpted for publicity purposes. DC Shorts reserves the right to promote any film or script to print, broadcast or internet media as required to market the Festival or our parent organization. THEATRICAL AND EVENT SCREENINGS. By submitting your project to DC Shorts, the filmmaker grants (1) non-exclusive rights to screen their film one-time at a public pre-festival open-to-the-public programming session. Selections for this one-time event will not be announced prior to the event. After final programming decisions are made, by accepting inclusion into the 2019 DC Shorts Film Festival, the filmmaker grants (2) non-exclusive rights to showcase their film during the festival week (September 2019) in as many screenings as required. This includes the competition screenings and the “Best Of” showcase which will play after competition ends. In addition, DC Shorts retains non-exclusive rights to (3) repeat films and showcases for the purpose of fundraising through December 31, 2019. All ticket sales are property of DC Shorts. INTERNET BROADCAST. DC Shorts may make films screened at DC Shorts available for commercial internet broadcast and download. Filmmakers have the ability to opt out of this program upon acceptance into the festival. This is an optional program in which the filmmaker has the ability to opt-in on acceptance of the Participation Agreement, sent on inclusion into the festival. TELEVISION BROADCASTS. DC Shorts reserves the non-exclusive right to repeat the various showcases on local (DC metropolitan area) cable access channels without any further compensation to the filmmaker. Filmmakers have the ability to opt out of this program upon acceptance into the festival. This is an optional program in which the filmmaker has the ability to opt-in on acceptance of the Participation Agreement, sent on inclusion into the festival. CONTROLLING LAW, VENUE AND SEVERABILITY. This License shall be governed by the laws of the United States and the District of Columbia without consideration of conflicts of laws provisions and principles. All claims between the parties, regardless of legal theory and whenever brought, shall be resolved in the state or federal courts of the District of Columbia, USA, and you stipulate that you expressly submit to the personal jurisdiction of such state and federal courts, and you further agree that any judgment may be entered in any court having jurisdiction thereof. If for any reason a court of competent jurisdiction finds any provision, or portion thereof, of this Agreement to be unenforceable, the remainder of this License shall continue in full force and effect. COMPLETE AGREEMENT. This License constitutes the entire agreement between the parties with respect to the use of films and supersedes all prior or contemporaneous understandings regarding such subject matter. No amendment to or modification of this License will be binding unless in writing and signed by an authorized representative of DC Shorts Film Festival. Nothing in this Agreement constitutes a waiver of DC Shorts’ rights under the United States of America patent and copyright laws or any other Federal or State law, nor of any of DC Shorts’ rights under the rules or laws of any country, territory, republic, and/or province. DC Shorts reserves the right to remove a film from the festival program for any reason or for no reason and shall not be liable for any refund or claims of any kind arising out of such removal.